The small preserved medieval walled city of Mdina set on a hilltop towards the west of Malta is a maze of narrow alleys and cobbled streets lined by elegant buildings and churches. Art, history and culture have all contributed to this architectural treasure. One beautiful view follows another in this magical place - it’s a photographer’s dream. Built around 4,000 years ago within thick fortified walls, the city has seen the Phoenicians, Romans, and Arabs come and go, leaving their mark and repeatedly changing the name of the city. Many of the buildings housed wealthy families. Today, most buildings serve the purposes of the Roman Catholic church. The Cathedral of St Paul faces on to a large square and marks the spot where St Paul supposedly converted the Roman Governor Publius to Christianity. A museum to the right of the cathedral exhibits sacred art and other artefacts collected over the centuries. 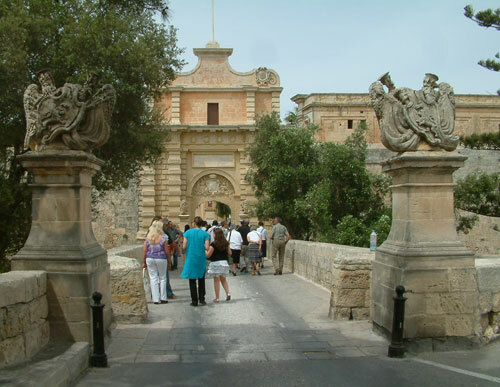 There are various commercial ventures in Mdina such as the Dungeons located to the right of the impressive main gate once you pass through it, followed by the Museum of Natural History. Other places inside Mdina that you may wish to visit include the Mdina Experience audio visual presentation of 3,000 years of Malta’s history at 7 Mesquita Square and a medieval experience at the Medieval Times at the Palazzo Costanzo in Villegaignon Street. Horses and carts ply the streets providing gentle horse-drawn tours of Mdina if you’re becoming weary and footsore. There is a coffee shop inside Mdina for refreshments and very nice cake. Climb the walls in Bastion Square for panoramic views of Malta. You will be able to see the Mosta Dome, the towns and cities and patchwork of cultivated areas. To save your legs, you may be interested in a land train tour of Rabat, Mdina, Mtarfa which takes about half an hour. Tours begin and end outside the Domus Romanus in Rabat but also stop in Mdina.